(1962) "I Will Follow Him"
(1963) "I Wish I Were a Princess"
"I Will Follow Him" is a popular song that was first recorded in 1961 by Franck Pourcel, as an instrumental titled "Chariot". The song achieved its widest success when it was recorded by American singer Little Peggy March with English lyrics in 1963. The music was written by Franck Pourcel (using the pseudonym J.W. Stole) and Paul Mauriat (using the pseudonym Del Roma). It was adapted by Arthur Altman. The English lyrics were written by Norman Gimbel. The song was first recorded by Franck Pourcel as an instrumental, and was released in 1961 on the European LP Amour, Danse, Et Violons. No.17 and on an EP on the La Voix de son Maître label. Pourcel co-wrote the song with his friend and fellow French bandleader Paul Mauriat. Mauriat later recorded an instrumental version, which he released on his album Paul Mauriat Plays the Hits of 1976. In 1963, Percy Faith released an instrumental version, re-titled "I Will Follow You", as the lead song on side 1 of his album titled Themes for Young Lovers. The album spent 28 weeks on Billboard's chart of Top LPs, reaching No. 32, and earned Percy Faith a gold record. In 1962, Petula Clark released a French language version of the song, titled "Chariot" (lyrics by Jacques Plante), which reached No. 1 in Wallonia, No. 2 in France, and No. 8 in Flanders, and earned Clark a gold record. Her English version reached No. 4 in Denmark, where it was released by Vogue, but failed to chart in the UK and the US, where it was released by Pye and Laurie respectively. Clark also recorded Italian and German versions of the song, with her Italian version, "Sul mio carro", reaching No. 4 in Italy, and her German version, "Cheerio", reaching No. 6 in West Germany. 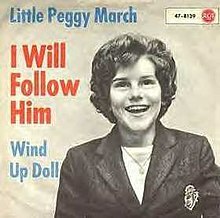 In 1963, Little Peggy March's version of "I Will Follow Him", backed with "Wind Up Doll", was released by RCA Victor. March's version spent 14 weeks on the Billboard Hot 100, reaching No. 1 on April 27, 1963 and spending three weeks in this position, making 15-year-old March the youngest female artist to have a U.S. chart-topping single. Her version also reached No. 1 in Australia, Hong Kong, Israel, South Africa, Uruguay, Canada's CHUM Hit Parade, New Zealand's "Lever Hit Parade", and Billboard's Hot R&B Singles chart. The song also reached No. 1 on the Cash Box Top 100, in a tandem ranking of Little Peggy March, Franck Pourcel, Petula Clark, Rosemary Clooney, Betty Curtis, Jackie Kannon, Joe Sentieri, and Georgia Gibbs' versions, with March's version marked as a bestseller. In Italy three versions of the song were in the charts in 1963 (translated/adapted by Vito Pallavicini and Bruno Pallesi): One recorded by Betty Curtis (highest position: No. 3), another version by Petula Clark ("Sul mio carro"; No. 4) and the Franck Pourcel version (No. 5). The song reached No. 1 in Italy's Musica e dischi, in a tandem ranking of these three versions. Curtis's version was also a top 10 hit in Uruguay. In 1963, Italian singer Ennio Sangiusto released a version of the song titled "Chariot (La Tierra)", which reached No. 1 in Spain. Also in 1963, Italian singer Joe Sentieri released a version of the song titled "La Tierra", which reached No. 3 in Argentina. In 1963, Argentine singer Alberto Cortez released a version of the song titled "La Tierra (Chariot)", which reached No. 2 in Spain. Also in 1963, Argentine singer Violeta Rivas released a version titled "La Tierra", which reached No. 1 in Uruguay. Dee Dee Sharp released a version of the song on her 1963 album Do the Bird. Sharp's version reached No. 1 in Hong Kong. In 1982, Dutch singer José Hoebee (former member of the girl band Luv') released a hit cover of the song, which reached No. 1 in Flanders, No. 1 on the Dutch Top 40, and No. 2 on the Dutch Nationale Hitparade. A new version, recorded in 2005, reached No. 90 on the Dutch Single Top 100. The Norwegian comedian Lars Mjøen wrote comedic Norwegian lyrics, «Torsken kommer!» (translates to «The cod is coming»). The song was published by the comedy troupe KLM as Brødrene Dal as the B-side of "Gaus, Roms Og Brumund" (PolyGram 2052 206) and on the LP record Spektralplate (Polydor 2382 135) in 1982. A music video remake was released by Norges Bank in 2017 to mark the introduction of the new 200 krone banknote that features a cod on the obverse side. The song is featured at the end of the 1992 film Sister Act, where it was performed by the nuns' chorus for the Pope with Whoopi Goldberg's character as the lead singer. The song is also used by Malaysian mobile service provider Digi for its extensive promotional campaign in late 2006, albeit with slightly different lyrics (as "I Will Follow You"). The first five notes of the song has since been made into the main jingle for future Digi advertisements. ^ "I Will Follow Him by Little Peggy March Songfacts". Songfacts.com. Retrieved 2015-05-29. ^ Paul Mauriat – Plays the Hits of 1976, norwegiancharts.com. Retrieved January 21, 2019. ^ "Winner of the Billboard DJ Poll Instrumental Album Award for 1963", Billboard, July 18, 1964. p. 5. Accessed February 19, 2016. ^ Popoff, Martin (2010). Goldmine Standard Catalog of American Records 1948-1991, Krause Publications. p. 414. ^ "Themes for Young Lovers – Percy Faith & His Orchestra". AllMusic. Retrieved January 21, 2019. ^ Billboard 200 – Percy Faith Themes for Young Lovers Chart History, Billboard.com. Retrieved January 21, 2019. ^ "Top LP's", Billboard. September 14, 1963. Retrieved January 21, 2019. ^ "Col. Convention's Grand Finale: Barbra Repacted, Awards, Show", Billboard. August 12, 1967. Retrieved January 21, 2019. ^ Petula Clark – Chariot, Ultratop. Retrieved February 25, 2018. ^ "Hits of the World", Billboard, December 8, 1962. p. 37. Accessed February 27, 2016. ^ "Hits of the World", Billboard, December 1, 1962. p. 34. Accessed February 27, 2016. ^ "Hits of the World", Billboard, October 27, 1962. p. 26. Accessed February 27, 2016. ^ Worth, Fred L. (1985). Rock Facts. p. 81. ^ a b c "Hits of the World", Billboard, July 13, 1963. p. 30. Accessed February 23, 2016. ^ a b "Hit Parade Italia – Top Annuali Single: 1963". Hitparadeitalia.it. Retrieved 2015-05-29. ^ Petula Clark – Cheerio, norwegiancharts.com. Retrieved June 3, 2018. ^ "Singles Reviews", Billboard, February 2, 1963. p. 30. Retrieved April 17, 2017. ^ a b Hot 100 – Little Peggy March I Will Follow Him Chart History, Billboard.com. Retrieved March 18, 2018. ^ a b "Hits of the World", Billboard, May 18, 1963. p. 32. Accessed February 23, 2016. ^ a b c "Hits of the World", Billboard, July 20, 1963. p. 27. Accessed February 23, 2016. ^ a b c "Hits of the World", Billboard, June 29, 1963. p. 46. Accessed February 26, 2016. ^ a b c "Hits of the World", Billboard, October 5, 1963. p. 22. Accessed February 27, 2016. ^ a b "CHUM Hit Parade – Week of April 15, 1963". Archived from the original on November 7, 2006. Retrieved 2016-02-19. CS1 maint: BOT: original-url status unknown (link) Chart No. 318. CHUM. ^ a b "Lever Hit Parade" 09-May-1963, Flavour of New Zealand. Accessed February 19, 2016. ^ a b "Hot R&B Singles", Billboard, May 25, 1963. p. 22. Accessed February 19, 2016. ^ "Cash Box Top 100", Cash Box, May 4, 1963. p. 4. Retrieved March 19, 2018. ^ "Hits of the World", Billboard, October 12, 1963. p. 40. Accessed February 26, 2016. ^ "Hits of the World", Billboard, October 19, 1963. p. 34. Accessed February 26, 2016. ^ a b "Hits of the World", Billboard, July 27, 1963. p. 42. Accessed February 26, 2016. ^ Fernbom, Hugo. Sommartoppen 1963, Datorföreningen vid LU & LTH, Lund University. July 16, 2008. Accessed June 25, 2016. ^ Little Peggy March – I Will Follow Him, norwegiancharts.com. Retrieved June 3, 2018. ^ "Top 20 Hit Singles of 1963". Retrieved 2 September 2018. ^ "Top Records of 1963", Billboard, Section II, December 28, 1963. p. 30. Retrieved June 19, 2018. ^ "Top R&B Singles for 1963", Billboard, Section II, December 28, 1963. p. 31. Retrieved June 19, 2018. ^ "Top 100 Chart Hits of 1963", Cash Box, December 28, 1963. p. 18. Retrieved June 19, 2018. ^ "Hits of the World", Billboard, March 3, 1963. p. 20. Retrieved April 22, 2018. ^ "Hits of the World", Billboard, August 17, 1963. p. 35. Accessed February 28, 2016. ^ "Hits of the World", Billboard, August 24, 1963. p. 42. Accessed June 17, 2016. ^ "Hits of the World", Billboard, June 15, 1963. p. 36. Accessed June 26, 2016. ^ "Hits of the World", Billboard, October 26, 1963. p. 47. Retrieved April 17, 2017. ^ "Album Reviews", Billboard, April 13, 1963. Retrieved June 20, 2018. ^ Top 40-artiest: José, Media Markt Top 40. Accessed February 28, 2016. ^ José – I Will Follow Him 2005 Version, Dutch Charts. Retrieved June 21, 2018. ^ Brødrene Dal – Torsken kommer, norwegiancharts.com. Retrieved February 17, 2018. ^ Williams-Grut, Oscar (24 May 2017). "Norway's central bank has made a bizarre music video to celebrate its new 'cod' banknotes". Business Insider Nordic. Retrieved 30 May 2017. This page was last edited on 16 March 2019, at 12:52 (UTC).